Japanese Beetles were first identified around the turn of the century as being a problem pest in the United States. They probably arrived in our country by being transported in the root system of some plant. Once planted in our soil, this pest quickly took advantage of the luscious plants, shrubs and trees gardeners and homeowners like to grow. Today, this beetle emerges in early summer and will eat just about anything we like to grow around the home. The end result will hurt the tree or plant they are feeding on and may lead to it’s death if left untreated. This article will provide some basic information about Japanese Beetles and then explain the best methods and materials to use for controlling them. Since these pests are stubborn and persistent, we will present the quickest and most acute methods for control. Japanese beetles live around one year. Eggs hatch in the fall, feed before winter and then overwinter by going deep into the soil below the frost line. In the spring, they will come back up to the top of the soil, pupate to adults and then emerge as the flying pest we all love to hate. Initially, the adults will seek just about any plant on which to feed. They love roses, birch trees, purple plums, crepe myrtle’s, dogwoods and cherry trees. However, no plant with succulent leaves is safe. This feeding will lead to massive destruction of leaves within a short period of time. The loss of leaves can be devastating to certain plants making them more vulnerable to fungus and drought. It is important to identify which plants the beetles prefer on your property and then make an effort to minimize the loss these plants suffer during the feeding time. Japanese beetles will feed for several weeks. After they have their full, they will mate and lay eggs. Females will lay 50-100 eggs in the grass and turf around your home. These eggs will emerge in late summer to early fall and begin the cycle again. Although most conventional methods of Japanese beetle control will instruct you to treat in the fall after the eggs hatch, the author will provide three methods of treatment which will get immediate results – regardless of the time of year. Since a complete Japanese Beetle control program needs to take place around the calendar, there is always something which needs to be done every spring, summer and fall. These methods will help to minimize plant loss and stop the further reproduction of local Japanese beetle populations. Now if you have a small amount of plants to treat, you might consider CYONARA RTS. 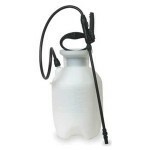 It comes in a handy “ready to spray” quart jug. Just hook it up to your hose and you can get right to work. If you have really sensitive plants like roses you may have to be careful spraying it weekly. 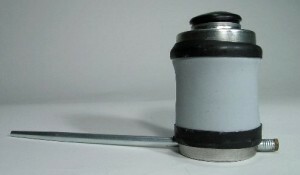 Part of the components of any emulsifiable concentrate will have a tendency to injure plants since it uses some oil base to keep it in suspension. This oil, as small of an amount that is part of the finished gallon, can injure really sensitive plant leaves. To avoid this from happening, use the PERMETHRIN DUST. This is a dry formulation which will quickly kill as well as repel adults for up to a week. Most importantly, it won’t hurt the plants in any way. Apply it with one of our HAND DUSTERS and you will be able to get great coverage quickly. 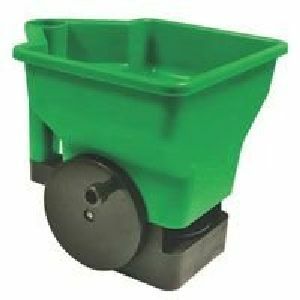 If you have a lot of plants to treat, get one of our DUSTIN MIZERS. This device will allow you to cover vast areas quickly. With the optional deflector connected – which you can see on the Dustin Mizer page – you can direct the dust right to the bottom side of plant foliage which is most important. For gardens growing edible fruit or vegetables, you’ll need something labeled for use in these areas and the best active at this time is found in VEGETABLES PLUS. 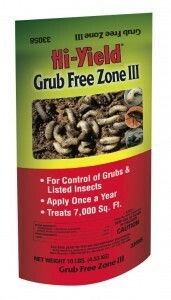 It uses an active known as Permethrin and works well on a wide range of garden pests like Japanese Beetles. Expect treatments to last 7-14 days; it can be sprayed on all fruit and vegetable yielding plants. If you’re looking for something organic, consider using INSECTICIDAL SOAP. It’s gentle enough to use daily and it won’t damage the plant or the harvest. Soap will work pretty well on Japanese Beetles but it’s not the strongest organic choice. A stronger organic option we like is MULTI PURPOSE INSECT KILLER. It seems to work the best on hard shelled insects like Japanese Beetles. Both Soap and Multipurpose Insect Killer are certified by NOP and approved for use for organic gardening so you can use them with confidence. Most importantly, they really do work well. The only drawback with the organic products is that they won’t provide a long term residual so expect to use the Soap several times as week in extreme cases; the Multi Purpose spray less often since it seems to last longer. The second priority is to lure away as many of the beetles as you can. This is done with BEETLE TRAPS. Don’t use them close to plants which the beetles are attracted to. Place traps as far away from your plant life as you can. In fact, if a neighbor wants to use traps, try to locate your traps as close to theirs as you can. The big problem with traps is they lure many beetles to your property which may have never come there in the first place. Japanese beetles are not the best flyers and tests show they will actually miss a trap by several yards about half the time they are following the scent from the trap. If your trap is placed away from plants you want to protect, the beetles that miss the trap will probably go to some wild plant or a neighbors yard and miss yours all together. If your trap is close to beneficial plants you want to protect, the beetles are likely to miss the trap and find their way to what you are trying to protect! The author has observed several homeowners who were so proud of all the beetles they had collected in their traps yet were amazed that so many were still on their roses! Don’t let this happen to you. 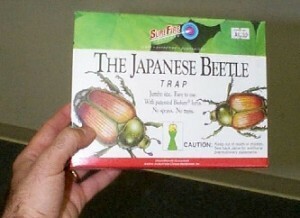 Use traps to lure beetles away from plants; place them at your properties edge or in a wooded lot by wild food. The third priority deals with stopping the cycle. This is done by using a grub control product in the fall. One of the best is a product called MERIT. It is both easy to apply and lasts a long time. Apply it with one of our GRANULE SPREADERS to get equal coverage around the yard. Remember, the grubs will be feeding through late fall and as the ground frosts they will simply move deep. Merit will penetrate the soil, kill active adults before they move deep and then stay in the soil throughout the winter. The following spring the Merit will still be active when adults rise back up. Though the product is designed to last for the whole year, you will get much better results if you treat in the fall and then again in the spring. This insures you won’t have any break in the residual due to excessive water or other weather conditions. Now that you have treated with the long lasting granules, don’t think you have done all you can. One of the best times to treat is in late spring – early summer as adults conclude their annual feeding frenzy. This is the time immediately after female beetles get their fill of food, mate and then lay eggs in the root systems of grass. The secret to timing this treatment right is to watch local populations of Japanese beetles and try to determine when they have finished feeding and are mating. After beetles emerge in the spring and begin to feed, at some point they will begin to mate. You will then be able to observe masses of beetles mating and some seemingly connected like a train forming links which may include several hundred beetles. Immediately after these mating orgies, females will land in turf areas to lay eggs. Expect to see this happen for one to two weeks during which time you will need to make one or two liquid treatments. Your treatment will serve two purposes. First, it will kill any females which are attempting to lay eggs. Secondly, if you use CYFLUTHRIN for this application, the adult beetles will be able to detect it’s presence and stay away from treated turf. 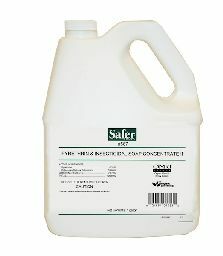 Apply the Cyfluthrin with one of our HOSE END SPRAYERS to get proper coverage. Even though the granules you should have applied are supposed to be active long enough to get the beetle larva when they hatch, spraying with Cyfluthrin insures you will be able to “nip them in the bud” just in case you don’t have enough chemical left in the soil to provide adequate protection. Although it is not likely that you will be able to stop local populations from growing, you will be able to control the ones trying to use your grass as their nest. Since plants on your property are most vulnerable to beetles developing immediately around them, keeping populations down in your turf will prove helpful in reducing attacks in the spring. Japanese beetles can cause massive damage to plants around the home when left to eat as they want. To get them under control, you can spray plants you want to protect with Permethrin or Deltamethrin along with some Spreader Sticker. Apply the long lasting Merit Granules in the fall and spring to stop developing grubs and be sure to spray with some Cyfluthrin in the spring/summer over your turf so no females try to lay eggs there. Have just been reading your info on Japanese beetles. I have about 5 acres of Grapes and Muscadines and the beetles ate me alive last yr I have a mist sprayer that I use on a 4wheeler. I would like your help with the spray that I need. I used fruit tree spray and soap after I started picking the grapes. I also have a few peaches apples plumbs pears and cherry trees that I need help with. I guess what I need is a complete schedule of all my spray needs. Thank you for your help. A longer lasting option would be the Vegetables Plus Permethrin. Treatments using this active will last a good week or two and you may find this better suited for the plants early on in the growing season. The longer lasting residual means this product will have a longer “days to harvest” but if you plan accordingly, this should be a non issue. Please notify me of the pesticide I need to kill the Japanese beetles inside because they are coming into my apartment. They fly around onto my television at night and around the window seals. I don’t know how they are coming in but they come in when the weather gets warm. A friend told me about the JBB and I looked them up.Thank you for the information about how to get rid of them. We have several products that will control them once they start coming inside. The first is an aerosol that can be sprayed around window frames, door frames and basically anywhere you see them. The Dforce Aerosol will kill them quickly but it can go on “wet” if you over spray and use too much so no need to over apply it. Personally I prefer the Phantom Aerosol because it goes on dry and is best suited for places where it’s hard to spray because it’s odorless too. The only drawback when using Phantom is that it won’t kill them quickly; it can take a day or two. But in the end it will work as well as the Dforce; it just takes a few days longer for you to see the results. I also like setting up some Powder Traps. These can be placed on any window where they’re accumulating and once they enter the trap, they’ll get caught and die. Very effective and helpful. I have used beetle traps but I never thought there would be so many. Over a 5 gallon pail from three traps and I wonder how many more can there be. I live in SE Kentucky on a 15 acre mini farm. Two things. First, as our article above explains, the Japanese Beetle Traps will attract beetles from miles around and should only be used on the outer edges of your property line. This way you’re not luring more beetles onto your plants because if you place your traps close to plants you want to keep beetle free, no doubt some beetles will find these very same plants and start feeding on them. Second, traps are only to be used as a way of monitoring the local population and should not be perceived as some type of control measure. Sure, reducing the local population will help but the 5-10% of the local beetle population the traps won’t catch can do substantial damage to your plants. To avoid this from happening, be sure to treat any shrub, bush or flower you’d like to protect with Vegetables Plus or organic Multipurpose Insect Killer. Beside spraying a tree with Savin what other steps can be taken to rid the tree of Japanese Beetle? Is there something you can place around the base of the tree that will deal well with these Beetles? As explained above, you first need to spray with Deltamethrin. Forget the Savin. It’s old technology that really smells bad and does more damage to the treated plant than any insect can normally do. 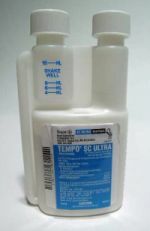 Today we have products like Deltamethrin that are odorless, far more active on target pests and last a lot longer compared to sprays like Savin. Next, treat your grass with Cyfluthrin or even better, the Merit Granules as our article above explains. This way the beetles which are mating won’t have a chance to lay eggs in your turf that can ultimately affect a lot more plants in your yard. I have Japanese beetles and live in California. They are in my backyard which is also utilized by my dogs. What can I use and not worry about it hurting my dogs? Thanks! In fact all of the products listed above can be used safely where children and pets reside. Now there are some guidelines, like keeping them off the turf when you treat and until the treatment dries. But in general, these are all common sense guidelines and are all nicely explained in our “safety videos”. These can be found at the bottom of each product page in our online catalog and are worth watching. In summary, once treatments dry, there is no inherent risk or danger to you or your pets when you apply our products properly.